Proof Bed Bug Spray has a reputation for being a high-quality plant based bed bug killing product. This environmentally-friendly bed bug spray has the capability to kill bed bugs when it comes into direct contact with them. Proof claims that it can eliminate bed bugs in an entirely natural way. Is this true or just hype from the manufacturers? ​This review aims to find out. Before we start, it’s important to remember that the only sure fire way to eliminate a bed bug problem is to get an exterminator. No product on their own will kill them all... unfortunately. With that said... let's get into this review. Some people like to use Proof Bed Bug spray because it’s an environmentally-friendly, plant-based product safe to use indoors. It offers a safer alternative to chemical-based insecticides that can be harmful to us and our pets. Well, the active ingredient is neem oil, which isn’t the best bed bug killer. It’s known to disrupt the reproductive cycle of bed bugs, but it may not be potent enough to actually kill bed bugs and control your infestation. ​Proof gets bonus points for being a natural solution to killing bed bugs, but it acts more like a repellent than an effective killer. In fact, Proof can often act more like a repellent than a killer. This means the bugs will detect the lingering residuals while they're hanging out, then they'll bury deeper into your house making them harder to find and destroy. Despite my harsh review... some people actually do LOVE this product. But given that it acts more like a repellent and it can potentially make your bed bug problem worse, I’m going to give it 3 stars. Let’s take a look at some of the pros and cons of Proof. Capable of killing adults, nymphs, and eggs. Non-toxic and safe to use around children and pets. Bugs can develop resistance and immunity. Strong lingering smell for up to 12 hours. High maintenance and costly – one bottle usually isn’t enough. It repels more than it kills, which is distinctly bad for bed bugs. Proof makes a lot of claims about how good the product is. This section looks at some of its key features that set it apart from other products. The spray uses a plant-based insecticide that’s derived from the neem tree. Proof is listed in the Directory of Least-Toxic Pest Control Products. This makes it very safe to use around your pets and children. Several other bed bug sprays use chemical insecticides, such as pyrethroids that can be harmful in large doses. If you do think you have bed bugs, we highly recommend first consulting with a local exterminator before using sprays or any other method of bed bug control. Improper use can and will make your bed bug problem worse. Azadirachtin is a component of neem oil, which is the active ingredient in Proof Bed Bug Spray. This stuff disrupts hormone levels and mating rituals interfering with the reproductive cycle of bed bugs. Proof has decent residuals that can last for up to two weeks after spraying it, which makes it an ideal product for frequent travelers. Proof also claims to offer protection for up to three weeks against eggs, which may or not be true. This study showed that natural oils are usually ineffective when used as a residual. Read Also: Can bed bugs jump? Proof is made by a company called Terramera, which was founded in 2009 and is based in Vancouver. This is a biotech company that specializes in pest control for both indoor and outdoor use. It also creates products for agricultural protection. Read Also: How much do bed bug exterminators cost? Their customer service is about average. You can contact the company through emails or via social media channels and most of the time you’ll get a prompt reply. They also have a 1-800 number to contact which directs you to the main company Terramera. There’s also a detailed FAQ section on their website. This guides customers to the answers and resources that they need. You can also download a pdf that has all the technical information on their products and step-by-step guides on how to use it. The company also provides online guides to help customers find their answers. Proof offers 100% Satisfaction Guaranteed and have a refund policy that lasts for 30 days after purchase. This is limited to a single bottle, which means you can only get a refund on one bottle. Compared to other companies, the refund policy is more flexible, which I thought was a plus. Most companies tend not to give refunds on bed bug products since it’s a difficult pest to kill with a single product. 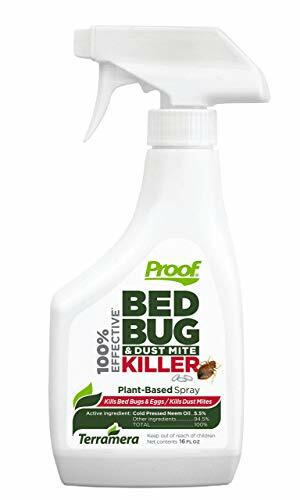 Proof Bed Bug Killer is a spray bottle that uses plant based ingredients to help kill bed bugs. This is great but sprays in general are not recommended when it comes to bed bug elimination. This is mainly because of how easy it is to over apply the solution and end up covering your home in insecticide without killing any bed bugs. Proof uses a plant-based insecticide that’s derived from the Neem tree. The active ingredient is Cold-Pressed Neem Oil (5.5%). This is mixed with other inert ingredients to maintain the correct concentration of Neem within the product. Cold-Pressed Neem Oil is a mixture of fatty acids, steroids, terpenoids, and natural oils. The active ingredients mimic naturally produced hormones and are consumed by the bugs. This blocks the real hormones from working, and then you have dead bed bugs (usually). So what does the research say about Neem Oil? This study took a look at Neem Oil and showed it didn’t have any significant effect on killing bed bugs. Neem Oil contains natural and essential oils, which has been found to be relatively ineffective when it comes to killing bed bugs. I don't ding Proof too much on their active ingredient, because most insects (natural or not) don't have much effect on bed bugs in general. Proof comes in a windex style spray bottle and is very easy to use. It takes a matter of minutes from opening the packaging to spraying it. Most users don’t have any problems with applying it and the nozzle is quite durable. This makes it slightly better than some of the other products. You also don’t need to mix it with anything before using it. Is This Pet and Child Safe? ​When it comes to features, this is where Proof really shines. When you have bed bugs, you want NOTHING MORE than to kill each and everyone of them immediately. This usually results in you buying the first product you see and spraying your house top to bottom in insecticide. Thankfully, the active ingredient "Cold Pressed Neem Oil" in Proof is safe to use around pets and children. This approved by the EPA for the safe use against bed bugs. A study out of Cornell shows that Cold Pressed Neem Oil doesn’t have any adverse effects on humans or animals. Neem has also been used in traditional medicines that date back for centuries. You can kill bed bugs only if the spray comes into direct contact with them, but this depends mostly on how deep they’re buried. If your bed bugs are buried deep, you’ll likely just be spraying your clothes and furniture with no real results. In theory, everything seems good and neem oil is great against some pests. But for bed bugs, it works more as a repellent than a killer. Below we have one of Proof's biggest competitor's Harris Bed Bug killer. We wanted to stack these two products up against each other to see which one comes out on top. 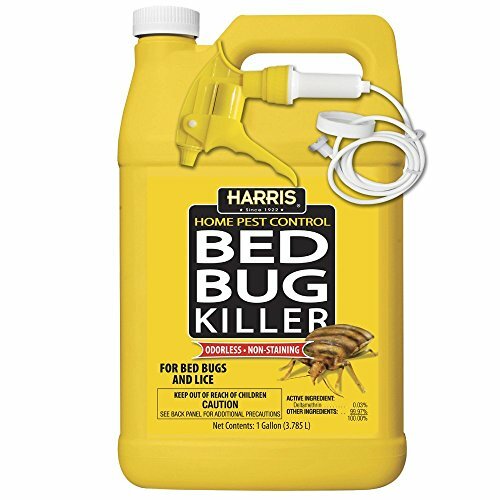 How Does Proof Bed Bug Spray Compare to Harris Bed Bug Killer? Harris is another odorless contact killer. It has long residuals against bed bugs and other pests including roaches. It’s difficult to use and it may not kill every single bug. Compared to Proof, Harris is a bit more powerful and can kill more of your bugs and acts as a more effective killer rather than a repellent. The nod here goes to Harris but only slightly. Want more information on this product? Check out our full review on Harris Bed Bug Killer. Proof is an "okay" product compared to other methods of bed bug control. "Proof gets bonus points for being a natural solution to killing bed bugs, but it acts more like a repellent than an﻿ ﻿effective killer." As I've mentioned above, it's one of the natural solutions to bed bug control on the market but how many bed bugs you'll actually kill can vary greatly. In general, we don't recommend bed bug sprays for bed bug problems unless directed by an exterminator as a part of a bed bug removal plan. There's simply too much risk that you'll be making your bed bug problem worse. In fact, bed bugs are one of the worst pests homeowners have to tend with, thus we recommend people use our local exterminator search tool to get a couple free quotes from professionals before trying to kill them on their own. I just purchase Proof bed bugs & hopefully it will work its very strong. I don’t have it bad but just making sure it doesn’t get worst. Customer service was easy to contact and nice to work with. Stood behind product all the way and more. Purchased product for a second time and had a different nozzle on it and didn’t spray correctly Sofia was quick to make it right. Glad you had a good experience Barry! Don’t have bed bugs but do have dust mites! After using proof spray and letting it sit for hours do I need to wash bedding and clothes? I am just starting to use it and it will not spray. I have pulled the handle under the nozzle like fifty times or more, it will not spray! Is there something else I have to do to open it? Hmm, it should work fine? Perhaps the nozzle is not unlocked. Think windex style setup. Let me know if you get it going! Hey Angie, thanks for the comment. Are you sure the dog doesn’t have fleas (as opposed to bed bugs)? Bed bugs don’t live on their hosts, therefore, a shampoo treatment wouldn’t work to well! I don’t have bedbugs but I’m dealing with dustmites. Proof has really proven to work great! I spray it all over the walls, ceilings, doors, crevices etc. The critters even got on my clothes! So I put a capful of Proof in my laundry, together with a hypoallergenic detergent, and then re-wash with just the detergent; and it works like magic! I’m able to wear my clothes again after considering throwing them all away. It does have a strong lingering smell when sprayed in the house, but I don’t care much about the smell as much I want to get rid of these cursed things. And by the way, I put some in my mop bucket when I’m mopping my floor, and it helps a whole lot. Hopefully this helps somebody. We use Proof for a dust mite problem about a month ago. It seems to have taken care of he bugs. The problem we are having is the smell is still lingering in our home. We have also experienced itchiness over the last month and can only attribute it to the spray. Is this common and what can we do about the lingering smell?